Be the first to share your favorite memory, photo or story of Damian. This memorial page is dedicated for family, friends and future generations to celebrate the life of their loved one. 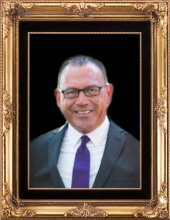 Damian K. Barr, 49, of IL, passed away Friday, February 8, 2019. He was born on February 20, 1969 in Toledo, OH to John D. and Ruth (Taylor) Barr. He was an educator by trade, most notably with LaSalle Public Schools in IL. He was a father first, who enjoyed traveling, rock music, and the ocean. Damian is survived by his sons: Mitch (Rachel) Barr, Zach Barr, brothers: Johnathan Barr, Perry (Carla) Barr, mother: Ruth Taylor, step-mother: Merla Barr, wife: Laura (Kostellic) Barr and her next of kin, mother of his children: Jackie Barr, and five nieces and nephews. He was preceded in death by his father and nephew: John R. Barr. Family and friends will be received from 10-11 a.m., with a Memorial Service beginning at 11 a.m., Friday, February 15, 2019 at the Marsh & Marsteller Funeral Home, 110 W. Main Street, Luckey, OH. Memorials may take the form of contributions to the family in care of Laura Barr, and will be directed to the Special Education Department at LaSalle Public Schools. To send flowers or a remembrance gift to the family of Damian K. Barr, please visit our Tribute Store. Family and friends will be received an hour prior to the service. Officiating, will be Rev. Bruce Bair. Memorials may take the form of contributions to the family. C/O Laura Barr, and will be directed to the Special Education Department at LaSalle Public Schools. "Email Address" would like to share the life celebration of Damian K. Barr. Click on the "link" to go to share a favorite memory or leave a condolence message for the family.